The private beach is a short stairway away from the house. Recline or dine in the magnificent great room or deck outside. Gourmet and family cooking in the open, airy kitchen. The bright downstairs double bedroom looks out on the water. Flexible sleeping for kids with a bunk and two singles. Spend the evening in the media room with books or games. Expand your sleeping with our double bed futon couches. Enjoy a good night's rest & awake in our sunny upper bedroom. Relax in the queen bedroom upstairs with a bayview balcony. After a refreshing ocean swim, wash off in our outdoor shower. The house has plenty of parking in our circular drive. 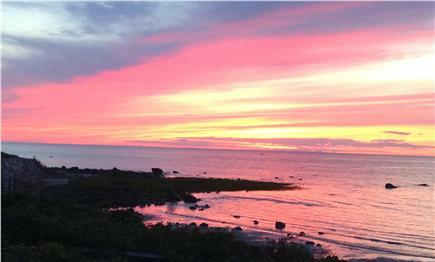 The end of a perfect beach day - a spectacular sunset. Beds: 2 queens, 1 double, 2 twins, 2 double futons. 3 singles in BR. 90 minutes from Boston - this beach house is a perfect get-away to unwind. Stroll daily along the ever-refreshing private beach or on the jetty. Walk less than a mile to Sesuit Harbor for boating, fishing, whale watching, a cafe, and more. Take a short car ride to golf, theater, shopping, and nature museum. Nearby 6A offers galleries, antique shops, libraries, and ice-cream treats as well as many markets and restaurants. 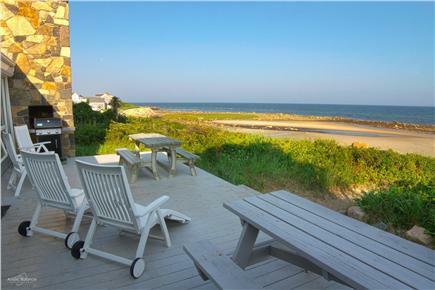 Set in a coveted location directly on Cape Cod Bay, this house has a private beach for fun fall activities such as sunning and walking, or just relaxing. 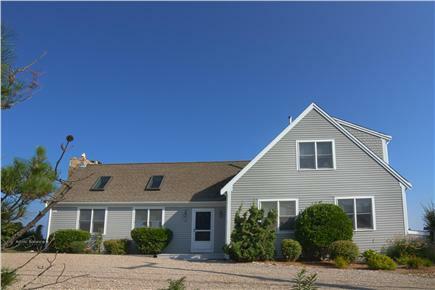 It's a casual, laid-back beach house with four bedrooms, 2 1/2 baths and is fully applianced. Enjoy spectacular sunrise and sunset on the spacious deck. Watch boats and ferries from Sesuit Harbor. The stunning great room has vaulted ceilings with grand floor to ceiling bay view windows. Sliders from the first floor bedrooms lead directly to the deck. On the first floor are two bedrooms - one bedroom with a double bed and the other bunk beds plus two singles. The media room serves for entertainment with flat screen TV, cable, games, and books plus expanded sleeping on 2 double bed futon couches. There is a bathroom with shower between the double bedroom and the media room as well as a laundry. A half bath is located in the great room. 2 steps to front door, 3 to side door, and 2 steps front and back onto deck then 1 step into back door. 2 bedrooms are on the 1st floor, and each of these bedrooms has a sliding door onto the deck. 1st floor bathroom has low step to the shower. This is the second year we have rented this property. It is the perfect location with a private beach and the Harbourside Cafe within easy walking distance. The cafe has become a morning breakfast tradition, but also fabulous for dinner or some oysters! The home has plenty of beach toys and beach chairs. There is a sandy area right off the deck where the kids enjoyed playing. At high tide you have just enough room for your beach chairs, which is when we chose to swim in the deeper water. At low tide it became a great beach to walk, relax and enjoy the tide pools. Thanks so much for your rent and for giving us feedback on your week at our family Cape house! I appreciate your telling us about the grill not being clean enough. I have let the cleaners know and they promised to keep it cleaner from now on, particularly if previous renters leave it in poor shape. I'm sorry you had to experience a grill that wasn't clean. Thanks for being flexible. And we look forward to your rental next year for the third time. Our stay was lovely. Clean and relaxing would stay again. We are delighted you enjoyed your stay at our East Dennis home. And thanks for your feedback. We will address it. Our family and friends had a wonderful and beautiful weekend stay in June. There is a nice large back deck which we didn't use that much (we opted to stay indoors for dinners because of mosquitoes and keeping the young kids in check). The bedrooms are comfortable, and having two bathrooms and one half bathroom is convenient for a large group. You have the option of using the household sheets and towels, which we did, but I'd suggest bringing and using your own if you can so you don't have to spend time washing, drying, and folding at the end of your stay if you have group (we had to do a few loads, which can take some time). The same with washing the dishes at the end - do them the night before and hand wash anything else. We have celebrated Girls Weekend for 25 years and this is our fourth time returning to this house. The house is perfect - from the location (right on the beach) to the size of the house which can accommodate a group our size, to the ease of working with the owners. House is in a great location and the views are spectacular. As advertised. Great private beach with great sunsets. Our kids love the house, the beach and the whole set up. Have rented multiple years in a row. Breeze off the bay keeps the house cool. Walk to Sesuit Harbor Cafe for breakfast, lunch, and dinner. We just returned from a wonderful family vacation at this home the end of June. We are familiar with the area and the great beach playground for children during low tide. You can’t ask for a better location with steps down to the beach where you can enjoy the tide pools or walk to the jetty. The house is also within walking distance to the wonderful Sesuit Harbor Café. We went there every morning for breakfast and enjoyed watching the boats come and go in the harbor. We had 7 adults and two toddlers for most of the week and an additional 2 adults for a couple of nights. There was plenty of room for everyone to spread out, although because we had such awesome weather, we spent all of our time on the deck or beach. We also brought a kayak which was easy to bring down to the beach for use at high tide. There were plenty of sand toys, chairs, noodles, and boogie boards in the deck box for use. We were up early walking on the beach and relaxing on the deck at night with a fire in the outdoor fireplace while enjoying the beautiful sunsets. We are looking forward to another great week next year! Wonderful and Relaxing Week of the Cape! My family had the pleasure of staying at this property in early June, and we loved the size of the home as well as the proximity to the beach! The house had everything we needed to just kick back and enjoy our time together. The bunk room was perfect for our two kids, and we loved the fun and whimsical decor.